the jump in basic fees. Edison’s proposal includes a leveling of the current tiered rate structure, from four tiers — with highest rates more than twice the baseline rate — to two tiers with only a few cents between baseline and nonbaseline rates. home’s energy mix. Edison’s baseline is now 53 percent of average residential use, but would be reduced to 50 percent. Under the current tiered structure, Edison’s rates in the lowest, baseline tier are 13.2 cents per kilowatt-hour, rising to 30.4 cents per kilowatt hour in Tier 4. The two-tier structure would by 2018 take the utility’s baseline rates to 16.2 cents per kilowatt-hour and nonbaseline rates to 19.5 cents per kilowatt-hour. A recent notice Edison sent to its customers contained examples showing that such changes could add an extra $4.50-$6.56 to monthly bills for ratepayers with using 500 kilowatt-hours per month or less. But those whose monthly use is more than 500 kilowatt-hours could see their bills drop $5.46- $12.53. The Imperial Irrigation District does not have a tiered rate system. Its basic electric rate is 7.8 cents per kilowatt-hour, plus an Energy Cost Adjustment fee, currently set at about 4.2 cents per kilowatt hour, which covers the district’s costs for buying fuel or power from outside sources. The four tiers, and the significant difference in rates between baseline and the top tiers, were established in the aftermath of California’s 2001 energy crisis and were aimed at capping rates for the lower tiers, Edison said in the filing. 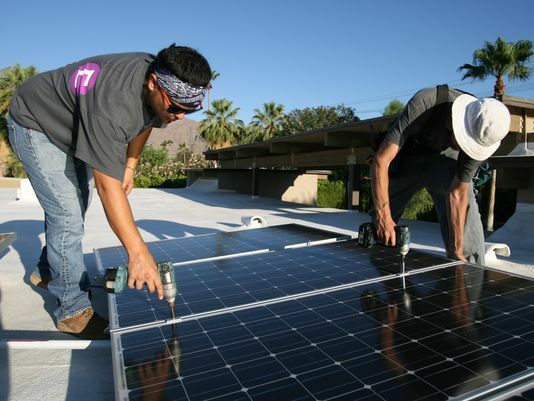 At Hot Purple Energy in Palm Springs, president Nate Otto said the typical payback period for a 10-kilowatt system is now about seven to eight years. Edison’s proposed rate changes could stretch that out an extra year, he said. “We could have flatter tiers and still have good incentives for Californians to go solar,” she said. “The commission could do both these things.” Edison summer rates going up?